On 12-13 December, the HZ Putnicki Prijevoz (Croatian Railways – Passenger Transport) hosted in Zagreb the 3rd project and steering committee meeting of Inter-Connect project (Intermodality Promotion and Rail Renaissance in Adriatic – Ionian Region) financed under the Interreg ADRION Programme 2014-2020 and supported by ERDF and IPAII funds. Being almost on the 12th month of project’s implementation, project partners had the chance to discuss the already achieved results and the ongoing activities, the next steps and to present an update on the state of play of the 8 examined cases promoting intermodality and rail-use. Municipality of Igoumenitsa, project’s lead partner presented the administrative and financial progress opening the floor for the discussion on the implementation of the technical work packages of the project. 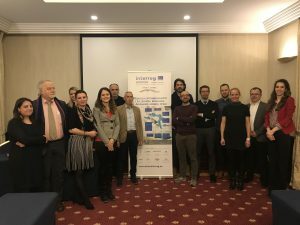 The discussion of the technical parts of the project started with the presentation of the 8 Inter-Connect cases by the respective cases’ leaders (Igoumenitsa, Region Emilia Romagna, Trieste, Zagreb, Ljubljana, Bar, Durres, Belgrade). Each responsible partner made a sum up of the activities that have taken place highlighting the next steps. 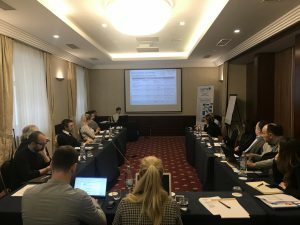 The Regional Development Agency of the Ljubljana Urban Region presented the final report on capitalisation of previous findings in passenger’s intermodal transport and lessons learned. The purpose of the activity was to collect good practices from participating regions and transfer this knowledge among partners and rest interested parties. Key takeaways of the report were the need to involve stakeholders from the private and public sector at all stages of mobility planning and the importance of knowledge transfer from different EU projects as well as to align International, European and national strategies in order to find common grounds of action. CERTH/HIT, the technical coordinator of the project, presented the overview of the data collection activity (transnational and regional/local transport demand and supply data) that is partially based on the survey designed at transnational level addressing tourists’ and locals’ connectivity needs and experience. Based on the achieved results of the project so far, CERTH/HIT presented also Inter-Connect toolkit, a tool designed with the scope to gather in one stop-shop all the knowledge on passengers’ intermodality promotion for building authorities capacities on effective connectivity plans development. Finally, the CEI-Executive Secretariat, responsible for the project’s communication & dissemination activities gave an overview of the implemented and remaining actions, stressing the need for intensified involvement from partners in the realisation of specific activities.